Full Transcript of July 2, 2018 hearing, Committee of the Whole, on Leaf Blower Legislation, Bill 22-234. On the afternoon of July 2, 2018, the Washington D.C. City Council's "Committee of the Whole" held a public hearing on Bill 22-234, the proposed measure to phase in battery-powered leaf blowers in the District and phase out two-stroke gas-powered machines. as a PDF file here. We think it demonstrates the detail and rigor of the proponents' case -- with new acoustic evidence documenting that gas blowers sound different, and that their noise penetrates much farther, than electric models do; plus real-world examples of successful businesses using the modern equipment; plus public-health evidence of the danger of not making the changes. Against these were the reassurances from two industry lobbyists that lawn crews could be "educated" to use their machinery more "considerately," a claim the industry has been making (without any supporting evidence) for at least twenty years. We will soon post on this site an indexed version of statements by witnesses at this hearing. For the moment, as a guide to the themes in this live hearing, you can search for the witnesses' names, to see testimony in these categories, or click on the links for their part of the hearing and their supplemental submissions to the record. IMPACT: How do Gas Leaf Blowers IMPACT individuals and the Community (click on links to see each witness' part of the hearing). SUPPORT: Is Support for legislation wide-spread? NEW TECHNOLOGY: Are battery-powered blowers ready for prime time? IMPACT ON BUSINESSES: Can and should lawn care companies make the transition? The full transcript is below, with with an indexed guide to additional statements coming soon. Chairman Phil Mendelson: I'm calling this hearing to order. This is a public hearing of the Committee of the Whole. I'm Phil Mendelson, Chairman of the Council and Chair of the Committee of the Whole. This is a hearing on two bills: Bill 22-234, entitled the "Leaf Blower Regulation Amendment Act of 2017." And Bill 22-839, entitled, "Amplified Noise Amendment Act of 2018." The stated purpose of Bill 22-234, that's the "Leaf Blower Regulation Amendment Act of 2017," is to amend the District of Columbia municipal regulations to prohibit the sale and use of gasoline-powered leaf blowers in the District of Columbia by January 1st, 2022. The stated purpose of Bill 22-839, the "Amplified Noise Amendment Act of 2018," is to amend the District of Columbia municipal regulations to limit noise in the public space generated by electronic amplification. Bill 22-839 also would update the definition of a noise disturbance to reflect recently renamed residential zones. To put that another way, the zoning commission changed the zoning regulations a year or so ago, and this would update the definition to reflect the correct designations for residential zones. Bill 22-234, the "Leaf Blower Regulation Amendment Act," was introduced by Councilmember Cheh on April 4th, 2017. And Bill 22-839, the "Amplified Noise Amendment Act of 2018," was introduced by Councilmembers Bonds, Evans, and Cheh on June 5th, 2018. There are a lot of witnesses for this hearing, and the way we've broken up the witness list is we will hear testimony regarding Bill 22-234, the leaf blower bill, first. And then we will hear testimony regarding Bill 22-839. Because of the large number of witnesses, and there are a total of 67 between the two hearings, witnesses will be limited to three minutes. And I will do my best to hold folks to the clock. We did indicate in the hearing notice that lengthier testimony would be allowed by prior arrangement, and there are four individuals who made that arrangement. They will have six minutes each. The record in this matter will be open for two weeks. That is, the record will close at 5PM on July 16th. What that means is that if anybody wishes to submit comments, who's here and is not testifying, or is not here and wishes to submit comments, or anybody who testifies and wants to supplement their testimony, has two weeks to do so. Not that the Council doesn't hear or receive statements following that, but we're required to file a record for the hearing, and that record will be filed based on what we receive before 5 PM on July 16th. Clearly, both of these bills concern matters of noise. That is of big concern to a lot of folks. And that's why we're moving to have this hearing today and see how we can move forward with the legislation. With that, let me turn to my colleagues in the order of their arrival. Councilmember, Mary Cheh. Council Member Mary Cheh: Thank you very much, Mr. Chairman, and thank you, everyone, for coming to the hearing. I appreciate your holding this hearing. We meet today to discuss these two bills that very materially address the health and quality of our lives in the District. And we're here to talk about, in particular, noise. Jarring, relentless noise that interferes, frequently with our ability to work, to concentrate, to relax, to enjoy each other's company, and to simply, on occasion, to savor peace and quiet that should come to all of us, at times. Now, it's true, I know, we live in an urban environment. And while we enjoy the extraordinary benefits of living in an urban environment -- our engagement, our culture, our diversity, all of the benefits that come from that -- we also have certain costs associated with that. Traffic congestion, a frenetic pace, pollution, light pollution, air pollution, noise pollution. But the fact is, we don't have to suffer the full unmitigated effects of these things, and so we should strike a balance. And that's what I think we're attempting to do with these bills. Bill 22-234, the "Leaf Blower Regulation Amendment Act," I introduced, as the Chairman mentioned. It would require that after January 1, 2022, so there's a long lead-in time, any retailer who sells gasoline-powered leaf blowers must provide a conspicuous notice on the leaf blower that it may not be used in the District. And then the noise level limitations on leaf blowers, I hear from residents all of the time about the nuisance and the noise that is created. It prevents them from working and it prevents them enjoying the peace in their own homes. Specific noise level limits are notoriously difficult to enforce under current law because they require a District official to measure the noise at the time that it's occurring using a decibel meter. However, gasoline-powered leaf blowers are significantly louder than their electric counterparts, and it's awfully hard to enforce the law as it's written today. Now, as a distinct side effect, wholly apart from noise, but as a good side effect, we know that gasoline-powered leaf blowers pollute the air and emit greenhouse gases. In fact, one study found that a two-stroke, gas-powered leaf blower emitted 23 times the amount of carbon monoxide, and nearly 300 times the amount of non-methane hydrocarbons as a pickup truck. On top of that, the cost of electric-powered leaf blowers has fallen in recent years, while at the same time technology has improved their effectiveness. So, we need to begin to phase out these noisy, polluting, gas-powered leaf blowers in the district in favor of a cleaner, quieter alternative. And the second bill, the "Amplified Noise Amendment Act," aims to address the problem of street performers creating loud, amplified noise that disturbs businesses and residents nearby. We've heard many, many complaints from those who live and work, as well as in neighborhoods in the District, such as Woodley Park, that these high-volume performances are disturbing sleep, interrupting business meetings, and reducing business at local restaurants. And, unfortunately, the District's existing policies restricting noise level in public spaces, namely the "Noise Control Act" and its accompanying regulations, are not well-tailored to address concerns about street performers' noise levels. It does not prohibit street performers from playing instruments in public places, but sets a reasonable limit on the amount of noise they can make. And I believe, again, it strikes a fair balance between the rights, in this case, of street performers to play their music in public spaces, and the rights of those who live and work in the district to enjoy their properties. And so I look forward to seeing both bills move forward, and I look forward to the testimony of the people who have come today. Thank you, Mr. Chairman. Mendelson: Thank you, Councilmember Cheh. Councilmember Evans? Councilmember Jack Evans: Thank you, Mr. Chairman. Good afternoon to everyone. Welcome to the Council. And thank you, Chairman Mendelson, for hosting this hearing on a very important issue. My involvement with noise goes back all 27 years I've been here on the Council. And so we've grappled with this issue for years, as to what to do. When you go back to the 1980s, there was a noise law. It was challenged by the labor unions. They were successful in overturning it because the decibel level was too low. We came back with another noise law, which was also challenged and ruled unconstitutional. I think at the end of the day, we ended up with a noise law in the neighborhoods, but not in the downtown area. And it kind of brings us to where we are today, where for the most part between I think 7 in the morning and 10 at night, there's no noise law in the downtown area. There are noise restrictions in the neighborhoods. And then always the discussion was between the reasonable person's standard and the noise meter. When we did have noise meter standards, a lot of times the decibel level was too high or too low. Or when we did have it, somebody didn't have the meter, there was only one meter, somebody didn't know how to use the meter, the meter wasn't available after 10 o'clock at night. I could go on and on with all of the practical implications of why we are where we are today. The reasonable personal standard is always challenged because what is noisy to one may not be noisy to another. When the police come out and say it's too noisy and people turn it down, and then the police leave and they turn it back up again. And then the police come back again. And what's the enforcement? What's the punishment? So, I say all of this because it's easy to talk about this in the abstract, but when you're really dealing with it on a day-to-day basis, it's very hard to figure out how to control this. I am very aware of, speaking in the downtown area, the changes that have occurred. Now, when I first came on the Council in '91, we didn't have anybody living downtown. And we had businesses that were largely fleeing the city. 27 years later, that has completely reversed itself. We have tens, at least ten thousand plus people living in downtown that weren't there before, and a whole array of businesses. In many ways, the District of Columbia is the most thriving city in America today. And it's only growing. There's more people living downtown, more businesses are locating there. And so you have this conflict between noise and businesses and residents. And so in other jobs that I've held, as a lawyer in law firm I remember being at the Washington Square building over Connecticut and L Street, and a gentleman would stand outside at 4 o'clock every day and play a trumpet. And he would play the Flintstones off-key. Seriously. Over and over and over again, making it almost impossible to inhabit the offices on the Connecticut Ave. side. He was within his rights to be there, playing the Flintstones off-key on his trumpet. So, what do you do with that? And one idea was go down and give him 50 dollars to go across the street, and play the Flintstones over there. But he wasn't dumb, so the next morning he was back out there again. And so, I say this, and it is interesting, funny, and difficult in another way. Gallery Place, what goes on over at Gallery Place now outside the Capital, what do they call that now? I'm just so used to the Verizon Center. Capital One Arena? I had the owner of the Monuments Sports call me and say, "There is a band playing outside my window." He's up on whatever the top floor is. And just blasting him out of his office, within the last three weeks. Is the band allowed to play there? Can they play as loud as they want to? Can they make it uninhabitable for somebody to be there? And then you have the preachers screaming and yelling up at the other corner, and then down in some of the neighborhoods. And I can go on and on, so I'm aware of all of this noise. And then, again, going back to Gallery Place, we have a ton of people living right there in the condominiums, and so what's the deal there, and how is this all working? And so that's what we're struggling-- And then you have the labor union issue, where the labor unions feel it's their right, their First Amendment right to make noise. To stand outside of a hotel with bullhorn at 6 in the morning and scream as loud as they can to wake up everybody at the hotel so they won't stay there, so the hotel will then acquiesce with the demands that the labor unions are making. So does that make sense? Is that a First Amendment right? Can you be as loud as you want to be no matter where you are, and demonstrate, and things of that nature? So, again, these are real-life problems that we're trying to deal with and accommodate a whole array of activities, and people, and businesses that are all occupying the same area, and trying to be fair to everyone. So, that's what we're grappling with, and it's not for a lack of an effort, or a lack of interest, because I've certainly been dealing with this for 27 years. So, we have a bill before us today. And there are many concerns with the bill, because it does not address the guy with the horn. It doesn't address the guys on the drums. It doesn't address a lot of those problems which, again, my neighbors are very, very concerned about. So, we have to figure out how far are we gonna go with this? What about the bullhorn? If a bullhorn is being used by a labor group outside of a building, is that okay? But a bullhorn being used by a bunch of preachers, that's not okay? So, how does that all work, and how do you monitor this? So, these are the issues we're dealing with, and I'm looking forward to certainly hearing from the public today, from all of you in the room, about the concerns you have. But more importantly is, what do you think we ought to do about it, given everything I've just said? What do you think we ought to do about it, and how do we approach that and stay within the constitutional limits that we have to operate in. Other cities, they always say other cities do it faster, better, quicker, and they don't. Every city in the country is struggling with this thing, and so how do we come up with a law, and then enforce the law so that everyone can enjoy the environment in which they are in? So, that's my observations, Mr. Chairman. I'm looking forward to what everybody has to say. Mendelson: Thank you, Mr. Evans. We'll proceed now with the witnesses. I may call witnesses up four at a time. Nancy Sainburg. Catherine Plume. David Cottingham, who's with the Audubon Naturalist Society. And Zack Kline. And Miss Plume is with the DC Chapter of the Sierra Club. Please be mindful of the time. I don't know if there'll be a chime as a warning. There will be a chime when your time is up, but the yellow light will go on, and then the red. Miss Sainburg? Sainburg: Thank you. Good afternoon, my name is Nancy Sainburg, and I'm the owner of the Enchanted Garden, a landscaping company located here in DC. We've been in business for over 30 years, and a majority of our business is in DC. We provide services to clients with properties as small as townhouses, and as large as several acres. Both commercial and residential properties. You may hear some testimony today that it is not possible for landscape professionals to do our job without gas-powered blowers. But I can tell you from my own experience that that is completely untrue. We've been using only battery-operated blowers for the past two years, and have had no trouble keeping up with the work in a timely manner. We've had no complaints from clients that our services are taking more time, and have heard nothing but compliments on low noise levels from the battery blowers. My epiphany regarding the switch from gas blowers to battery blowers occurred two years ago. I was out walking my dog, and I heard a leaf blower. When I got closer to the noise, I realized that it was my own landscape crew, who were finishing up an installation in my neighborhood. I had heard it from over two blocks away. That was it for me. The noise pollution was just too much. I went out the next week and bought a battery-operated blower to see how well it worked. The initial reaction from my crew was, "Okay, we'll give this toy a try." But pretty soon they were favoring the battery-powered blowers over the gas blowers. The following spring season, we switched to all battery-powered equipment. The crew asked if we could keep one gas blower for the fall leaf season, and I decided to see what would happen. Once the fall season came, no one even once mentioned using the gas blower. The people who worked with this equipment every day have said that they enjoy using it much more than the gas equipment. They're not subjected to high noise levels, and they don't have headaches at the end of the day, which was often a complaint. Thank you. Mendelson: Thank you, Miss Plume. Mr. Cottingham? Cheh: Okay. Okay, thank you, Mr. Chairman. Evans: I have no questions, but thank you all for coming down. Mendelson: Thank you to each of you for your testimony. Bob Mann, who's with the National Association of Landscape Professionals. Grif Johnson. Chris Pollock, who's an acoustics expert. And Jamie Banks, who's Executive Director of Quiet Communities. Are you Bob Mann? You're Bob Mann? Great, why don't you start? And you all had pre-arranged six minutes each. Mendelson: Thank you Mr. Mann. Mr. Johnson? Johnson: Good afternoon, Mr. Chairman and members of this Committee. I'm Grif Johnson, I'm one of the founders of Quiet, Clean DC. We're a group of concerned DC residents who are worried about a significant problem in our city, and indeed, all around the country. That problem is the invasive, harmful noise generated by the gas-powered leaf blower. I also wanted to thank you, Mr. Chairman, for convening this hearing, and I want to thank Councilmember Cheh for introducing the bill that's under consideration today. And Councilmembers Bonds, Grosso, McDuffie, and Allen for co-sponsoring the bill. We also want to thank those additional Councilmembers who have assured us of their support for the legislation. The bill in question will amend the District of Columbia Noise Control Act of 1977. That act stated that chief among its purposes are, and I quote, "To preserve, protect, and promote ... the peace and comfort of inhabitants in the city." Subsequent to the 1977 act, the Council in 1992 adopted a regulation that addresses leaf blowers, specifically. That regulation limits both their hours of operation and their noise output to no more than 70 decibels at a distance of 50 feet. But the regulation doesn't work. As you'll hear today from witnesses who support this bill, your constituents across the District are up in arms over the deprivation of their peace and comfort from excessively noisy gas-powered leaf blowers. More than a quarter of the advisory neighborhood commissions in DC, representing 7 of our city's 8 wards, have adopted resolutions endorsing this bill. Over 2,300 individuals have signed an online petition urging the Council to move forward on this bill. We hear it from every corner of the city: "Stop. The. Noise." Why doesn't the current regulation work? Because it requires for its effective enforcement that an appropriate agent for the DC government must verify the operation of a leaf blower above the 70 decibel limit, and beyond the 50-foot distance. That means the enforcing agent must come to the scene of the violation while it's underway, and armed with a sound meter and a distance-measuring tool, for which he would need to have been specially trained, then confirm the violation. It simply is impractical for all of that to happen before the operator of the violating equipment will have ceased such operation, or will have moved on to another property, where he'll engage in a new violation. And there's another reason why the current regulation is ineffective. That's because the regulation relies solely on sound measurements in decibels. That approach overlooks the most offensive element of noise produced uniquely by leaf blowers that are powered by gas. As you'll hear in a few minutes, research that my colleagues on this panel, Mr. Pollock and Dr. Banks, will present to you this afternoon, establishes that what differentiates the gas blowers noise is a very strong, low-frequency component that a battery-powered blower, having an identical decibel rating as the gas blower, doesn't generate at the same strength level. That powerful, low-frequency element is the source of the greatest offense to the human ear. These complaints all relate to noise from gas-powered leaf blowers. The blowers generate not only high levels of the most disturbing low-frequency sound components, but also enormous decibel outputs, well above the limits for safe human exposure. The Centers for Disease Control and Prevention last year published a finding that two hours of exposure to a leaf blower operating at 85 decibels will cause hearing loss. And hearing loss is permanent. Once your hearing is gone, you can't get it back. The defenders of these thunderous gas blowers actually brag about them. Consider an article recently published in OPEReviews.com, an online publication for the landscaping industry. The article gets right to the point. Here are the first two sentences. "What does it feel like to have Hurricane Irma strapped to your shoulders? Donning any of the leading backpack blowers will give you a close representation,"
The article notes that seven models of the most popular gas blowers deliver sound at the operator's ear of between 101 and 104 decibels. Decibels are measured logarithmically, so that a difference of as little as three decibels represents a doubling of the sound's energy. We're talking about noise that's several orders of magnitude above the CDC limit of 85 decibels, and that's at the ear of the operator. Proponents of the gas blower claim that a so-called quieter gas blower is now available. In a few moments, you'll hear Mr. Pollock play for you an audio clip of this supposedly quiet gas blower, which includes that low-frequency component that's so uniquely powerful with gas blowers, and not with the battery blower. You can decide for yourself in just a minute whether the so-called gas, so-called “quiet gas blower”, is indeed quiet. In reality, very few landscaping contractors are using this much-ballyhooed quiet gas blower. In an Op-Ed published in January in TotalLandscapeCare.com, which is another online publication for landscapers, one of the leading advocates for gas blowers pleads with landscape contractors to start using the supposedly quiet gas blower, or else cities like ours will adopt laws to phase out gas blowers altogether. And we hope you will. So, returning to our current regulation on gas blowers, it's unworkable as I said because it can't be effectively enforced. But a law that simply bans all gas blowers won't be difficult to enforce because a gas blower can be easily identified visually, without the need for taking measurements of decibels and distances. And a ban on gas blowers will free all of us from having to endure that powerful and aggressive low-frequency noise element that the gas blower emits. That's why we support this bill. It will work. Thank you, Mr. Chairman. Mendelson: Thank you, Mr. Johnson. Mr. Pollock? Pollock: Thank you, Mr. Chairman and Councilmembers. I'm Chris Pollock, an acoustic consultant with Arup, with 20 years of experience measuring noise and designing buildings and spaces for suitable acoustics and noise conditions. I have a degree in mechanical engineering, and I'm a licensed professional engineer in the Commonwealth of Virginia, and I've been published in articles in the field of acoustics, and interviewed by various media outlets regarding acoustics and noise. Arup was asked to perform acoustical measurements, to provide technical, acoustical input and support for the testing and review of a group of leaf blowers. The questions we were asked to help answer were, "What is the difference in characteristics of the sound produced by commonly used commercial gas leaf blowers compared with commercial-grade battery blowers?" Secondly, "What are the implications for communities in which those machines operate?" We are not investigating the noise level at the operator's ears relative to exposure, but rather the impact on people in the community surrounding the leaf blowers as they are being used. We designed a set of tests that, in our experience, would allow us to capture side-by-side noise levels for various leaf blower types. It was arranged that seven commercial blowers would be used. Blowers were selected for comparable flow rates and decibel ratings. The leaf blowers selected, and their corresponding labels on the graphs are outlined below as part of the testimony. The battery powered blowers are labeled in blue. The Greenworks GBB 700, GBB 600, the Chevron EGO 600, and the Stihl BGA 100. The gas blowers are labeled in orange. The RedMax EBZ8500, the Stihl BR700X, and the ECHO PB-760. The full details of the testing sequence, equipment, and protocols will be outlines in my written report to follow. Some of the summary results are outlined below. The horizontal axis on the charts that you're looking at shows frequency, with the left side of the chart being a very low-frequency rumble sound, and the right side being a very high-frequency hissing sound. The vertical axis shows increasing sound pressure level and loudness as you go up the chart. The interesting points to note from our testing are where there are significant differences. From the data above, we observe that clearly the group of gas leaf blowers all exhibit a much higher level of sound energy in the low-frequency bands. In a number of cases, this engine noise is at a peak of a 100 to 125 Hertz. This energy is quite distinctly different for the gas blowers than the battery-powered leaf blowers. This is highlighted by the two blowers, the ECHO PB-760 and the Greenworks GBB 700, both of which are measured at 66.5 decibels at 50 feet, but with dramatically different acoustic qualities and audibility at 50 feet and greater differences. Secondly, the audibility over distances. Based on our experience measuring sound, I witnessed that the three gas-powered leaf blowers at an 800-foot distance were audible, two being clearly audible, the RedMax EBZ8500 and the Stihl BR700X. And the third, the ECHO PB-760, being noticeable. While the battery-powered blowers at that same distance were not distinguishable above the very quiet community sound levels at that distance. Audibility within houses. One of the challenges with low-frequency noise is it requires heavy construction and materials to stop sound transmitting from the outside of the building to the inside. With leaf blowers, the low-frequency component of the gas leaf blowers is what is most readily transmitted, and this is clearly seen in the testing results at a 100 to 125 Hertz. The sound levels of gas leaf blowers are measured inside the house are significantly above those of the battery-powered leaf blowers, even when both of the leaf blowers are rated at the same decibel level at 50 feet. Finally, how they sound. We will demonstrate for you now some of the sounds of the leaf blowers captured during our testing so you can experience the sound levels in a community with gas and battery-powered leaf blowers. These samples are calibrated to represent the measured sound levels accurately so that your experience is as close as possible to the real, measured conditions. The first sample is a comparison of a gas leaf blower at the same decibel rating based on the manufacturer's testing standards, and our testing. [Audio file played] The important comparison is that while the overall loudness may be the same, the acoustical qualities of each are totally different. Relative to impact on a community or a specific individual, it may help to set the scene and imagine yourself in your own yard doing your own thing, reading a book, relaxing on the deck or porch, or sitting talking to your neighbor. 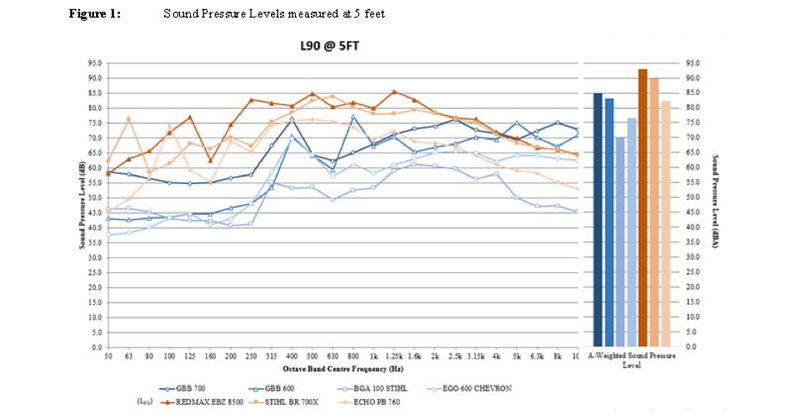 In summary, our measurements indicate that the gas leaf blowers have a significantly greater low-frequency component. This low-frequency sound creates a different acoustic quality of the sound of gas leaf blowers versus battery leaf blowers. Because the low-frequency sound travels further, it is audible over greater distances, transmits most easily through the windows and glass doors of homes, and is more audible inside the home. The measured gas leaf blowers have a greater noise impact on the community than the measured battery-powered blowers. Thank you. Mendelson: Thank you, Mr. Pollock. Miss Banks? Banks: Thank you, Chairman Mendelson and members of the Council. My name is Jamie Banks. I'm the Executive Director of Quiet Communities. We're an independent, nonprofit organization. Our mission is to help transition landscape maintenance to low-noise, zero emissions practices, with positive solutions to protect the health of workers, children, the public, and the environment. I was trained as a healthcare scientist. I worked for many years in health economics outcomes and policy before turning to environment. I hold master's degrees from MIT and Dartmouth Medical School, and a PhD from the University of Kent in the UK. I have been asked to testify about the impact of leaf blower noise on communities and on the health and wellbeing of community residents. Today gas-powered leaf blowers are ubiquitous throughout the country. They are widely used in the commercial landscaping industry, today worth about 66 billion dollars in annual revenues. While all gas blowers emit all manner of unhealthy pollutants, today we're focusing on the noise they emit. Noise emitted from gas blowers is part of the cumulative environmental noise in which we all live. Today large numbers of people are involuntarily exposed to levels that are harmful to both hearing health and general health. Increasing concerns about environmental noise levels have earned them the label, “the new secondhand smoke”. Many health organizations, as you'll see from the slide are concerned with the noise produced specifically by this piece of equipment, the gas blower, and its potential health effects. Here's an example from a special report that Harvard Medical School wrote. Extensive evidence from the medical and scientific communities has shown that high levels of noise have adverse health effects ranging from heart disease and hypertension, to sleep disturbance, to psychological, cognitive, and learning issues, as well as plain old annoyance. The effects of excessive noise are particularly acute for children, seniors, people with hearing disorders and neurological conditions like autism, and sensory deficit orders. These people can actually experience pain from this type of noise. And those who are arguably among the most exposed, the more than one million workers in the landscape maintenance industry, over half of whom are Hispanic and Latino. For those operators, noise at the ear is much louder than noise reaching anyone else. Grif alluded to these seven popular models of gas leaf blower models. They're shown here on the slide. More than 100 decibels at the operator's ear. Up to 83 decibels at 50 feet. Two are among the three gas blowers that were tested in the acoustics study. These levels are orders of magnitude above occupational and public health standards. That means ten times a hundred times a thousand times. To examine the community impact of gas and battery blower noise, we applied the sound levels that were recorded in the acoustics study over a distance, and applied them to a hypothetical urban neighborhood with 1/8th acre zoning. For each of the seven blowers tested, we calculated the number of homes affected by unhealthy levels of outdoor daytime noise, defined as 55 decibels by the World Health Organization and Environmental Protection Agency. As you can see on the slide, for the battery blowers, the two at the top, unhealthy noise will affect between one home and six homes depending on their decibel rating. For the quietest gas blower, up to 23 homes are affected. For the other two gas blowers, up to 91 homes are affected. This is because you're squaring that radius of the circle and getting a much wider area of effect. In everyday terms, this means that unhealthy noise from a single gas blower can intrude into an area encompassing more than 90 homes, and presumably any outdoor playgrounds, parks, and schools in the neighborhood. This situation would be exacerbated if more than one blower is used on a property, or when several properties in the neighborhood are being maintained. The distress caused by gas blower noise has prompted 170 communities across the country to enact legislation to ban or restrict their use. Many others are making similar efforts. Beyond the community level, the state of Massachusetts recently put out the nation's first technical specifications for commercial-grade battery-powered equipment to encourage state agencies, public schools, and municipalities to transition. Mendelson: Thank you to each of you for your testimony. So, I guess I have a couple of questions. One is that I've always thought that the damage from noise is the higher the decibel. But what I'm hearing is that there's another factor as well, and maybe I should look at-- Mr. Pollock? Can you answer that? Pollock: Human hearing is sensitive to different frequencies. The lowest frequency being about 20 Hertz is what we hear. The highest frequency is about 20,000 Hertz. Low frequency, especially impact or drone-type sounds are often more damaging that high frequency, but overall the loudness is what damages your hearing, the raw sound pressure. Mendelson: The loudness? That's the decibels, whether it's 85 or 100, or whatever the number. But the low frequency is damaging as well? Pollock: [Speaking to Miss Banks] Do you want to answer that? Banks: The low-frequency component of sound is what's responsible for carrying it over distance and allowing the sound to penetrate through windows, so that people in their homes are affected, and other sorts of buildings are affected. There's different types of health effects also associated with low-frequency noise that tend to be non-hearing, adverse effects. Mendelson: Now, looking at noise regulations, typically if they use any objective measure or standard, it's in decibels. Is there any jurisdiction that differentiates in terms of regulation between high frequency and low frequency? Do any of you know? Pollock: I believe there are a number of states around the country that do, yeah. They stipulate not only a highest sound level, but also a spectrum of sound that can't be exceeded in each octave band, or 1/3rd octave band. Mendelson: Is that in an occupational setting, or in a community setting, such as a noise ordinance? Pollock: That's in a noise ordinance, community setting. Mendelson: Would you be able to send us some examples? I mean, how would you enforce that, though? Pollock: With sound measurement equipment. It may require someone to be live to measure sound levels with a moderately advanced piece of equipment. Mendelson: Because I think that's one of the challenges. I mean, the bill that you're testifying about is the leaf blower bill, but we have a second one dealing with noise ordinance and more generally, an amplified noise such as from musicians, street musicians. And I've heard over and over from the government that it's almost impossible to enforce a decibel level. I don't see how it would be any easier if it was based on the frequency, the noise frequency, sound frequency. Pollock: No, it would be the same equipment and the same trained person making that measurement, whether it's overall decibel level or a frequency-based level, it would be the same measurement that you would use. Mendelson: Mr. Johnson, you look like you wanted to say something. Johnson: Thank you, Mr. Chairman. Yes, I was just going to say that I think that where you're going is the problem that we currently have, which is an ordinance, or rather a regulation that tries to limit the damage by a measurement that is really impractical of being measured because of the—what Mr. Pollock who has just answered your question. It requires an on-site, trained individual with the proper equipment, at the time the violation is occurring, to measure whether or not that violation is occurring, both on the decibel level, and on the distance from what's called the centroid, the point where the noise is generating. And that just hasn't been proven practical. Why we recommend this bill is because it's much simpler to enforce. You simply observe that the operator is operating a gas-powered leaf blower, and you take steps to advise that person that he is no longer in compliance with the law after December 31, 2021. Mendelson: So, Mr. Pollock, Mr. Johnson is saying it is difficult to enforce. Do you disagree? Pollock: I'm testifying as to the measurement process. So, the measurement process would require someone to be live and to measure. How that's enforced would be something that would follow the measurement to prove whether you're above or below the level. Cheh: Okay. All right, thank you. I have no further questions. Easterbrook: Thank you, Councilmembers Mendelson and Cheh. My name is Gregg Easterbrook. I'm a contributing editor of the Atlantic Monthly and a fellow of the American Academy of Arts and Sciences. My Atlantic Monthly colleague, James Fellows, a former White House official, is submitting for the record a detailed statement that I will present here in a fast-forward version. I've written extensively about the interaction of new technology and quality of life, including in my current book. The conclusion reached is relevant to what the Council is considering today. It is as follows. In every case -- not in many cases -- in every case when clean, new technology replaces obsolete technology, quality of life improves, costs are lower than expected, and people say, "Why didn't we do this sooner?" Mendelson: Thank you, Mr. Easterbrook. Miss Orlins? Mendelson: Thank you, Miss Orlins. Mr. Small? Mendelson: Thank you, Mr. Small. Miss Pierce? Pierce: My name is Lucia Buchanan Pierce, and I am a longstanding resident of Ward 3. I'm here to introduce a video on behalf of my friend, Deborah Fallows, a founding member of QCDC. Mrs. Fallows regrets that she could not be here because of an unbreakable prior commitment. In Mrs. Fallows' words, "The video will show you Gene Jackson, who I've known and respected for several years. He is an award-winning, lifelong groundskeeper at the University of Redlands, in Redlands, California. Mr. Jackson will describe the effects of his hearing loss resulting from decades of operating gas-powered leaf blowers. Recently, Mr. Jackson was able to switch to battery-powered blowers, which he will be demonstrating in this video." Announcer: Eugene Jackson is a lead landscaper and grounds worker at the University of Redlands in California where he has won numerous awards for civic leadership and employee excellence. In keeping with the university's longstanding workplace policies, Jackson and his crews have always worn headsets and other protective equipment while on the job. Even so, according to medical screenings sponsored by the university, his years of exposure to leaf blower noise have cost Jackson 65 percent of his high-frequency hearing ability. Eugene Jackson talks with Shelly Stockton, director of Alumni and Community Relations for the University of Redlands, about the surprisingly personal effects of this kind of hearing loss. Jackson: Well, that sound, kind of a sad thing. And I was discussing with one of my family members regarding my hearing, and here at the university, our kids can come to college for free. And I was telling my family member that I'm losing my hearing even more each day, but I need to stay here and continue to be a professional gardener so my son can get a four-year education, college education. He's very bright, he's a straight-A student. But he overheard this, and he didn't want to go to college because he felt I was losing my hearing, and he didn't want that to happen. He'd rather see me work somewhere else than for me to hurt more, with the hearing. So it has affected me and my family. But I am determined to see him through the four years, or maybe eight that he needs to go through, through this process. So, it's a very emotional thing when you lose your hearing, and the environment is so bad with the pollution, so it's really affected us a great deal in my home. Announcer: In addition to the safety policies, medical screenings, and family scholarship benefits that workers like Eugene Jackson have appreciated at the university, Redlands is one of a growing number of progressive institutions that are determined to protect the environment and their communities by investing in quieter, safer, much cleaner, electric-powered equipment. Mendelson: Thank you, Miss Pierce. I have one question. And that is each of you are testifying in support of this legislation. The legislation proposes a phase in. Maybe I shouldn't say a phase in, a delayed applicability of January 1st, 2022. Do any of you know why that date? Mr. Small? Small: That was the date that one of our team members suggested would be a reasonable time to allow the maintenance companies using gas blowers to not have to buy new equipment right away, and so forth. I've seen, recently, there was a place where -- I don't remember exactly where a bill was passed with only 180 days allowed for the phase in. I'm not proposing that, necessarily, but as I've joked to my crew, I want to see this happen before I die. Mendelson: But that's a four-year delay. Do any of you know what the life cycle is for a leaf blower? Orlins: I don't know exactly--I think, certainly, within this amount of time. I think the cycle is maybe around three years, maybe four. But somebody else might know better. Small: I've heard that the machines start deteriorating, something to do with ethanol and mixture of fuel and oil, that they start deteriorating within two to three years, and so these machines are going to die anyway. Mendelson: Thank you. Councilmember Cheh, do you have any questions? Cheh: Thank you, Mr. Chairman. I just have one, and it's for Miss Orlins. I just wanted to underline the point which I think you made, but I want to refer to it again. That is to say that this interest in doing away with these gas-powered leaf blowers is not limited to one or two wards, that it's something that you have garnered support for across the district. Could you elaborate on that a little bit? Orlins: Right. Grif Johnson, who spoke earlier, he visited quite a few ANCs, and I believe nearly all of them endorsed it and passed resolutions. I'm not sure if it's 12 or 14, I think we had 12 actual resolutions and two more that were in the process of completing that. And then that amounts to 40-some neighborhoods. Or, anyhow, quite a few neighborhoods throughout the city. And it's seven of the eight wards supported this, yes. Cheh: Thank you very much. Thank you, Mr. Chairman. Mendelson: Thank you, Councilmember. Thank you to each of you for your testimony. Hugh Allen, representing the Ward 3 Democratic Committee. Anne Cauman. Joey Spatafora. And Ann Mladinov. Mr. Allen, when you're ready. And good afternoon. When I heard that Councilmember Cheh had sponsored this bill, I was totally thrilled. And I just want to see these things banned. I think it's a health issue, not a money issue. And to the extent it's a money issue, those of us with health problems are going to have to pay. And the big lawn companies aren't going to be the people paying the bills. Thank you. Mendelson: Thank you, Miss Cauman. Mr. Spatafora? Mendelson: Thank you, Mr. Spatafora. Miss Mladinov? Mladinov: Thank you, Mr. Chairman, for holding this hearing and taking comments on the leaf blower issue. I really appreciate all of the information that we've already gotten from the experts on this issue, just today. It's really important to get that out on the record. I'm an ANC commissioner in 3B Glover Park, Cathedral Heights. I'm testifying today as an individual, not a representative of my ANC. We have a lot of small yards in ANC3B, but we also have some large apartments with lawns, and gardens, and sidewalks, and driveways that they want to keep clear. So, we've heard about noisy leaf blowers for several years, and have had discussions about it, and have done some reading about it since the bill was introduced by Councilmember Cheh in 2016. But we were uncertain how to take care of the problem. I think you know the saying, "If this were easy, it would be done already." All of us care about the environment and carbon emissions, energy use. And none of us like the noise. But with most issues that are complicated, as with this one, we rely on the Council to pull together the research, hear from a range of parties involved, do your deliberations, and come up with a solution that works. We really do trust our Councilmember, Mary Cheh, to do the right thing on energy and environment issues. When we took up this issue, we had several questions. All of us supported having a hearing, but I and other commissioners and constituents had some doubts about the enforcement mechanisms in the bill. They wanted to know more about the advancing technologies, and whether there might be some electric leaf blowers that were actually getting as loud as some of the gas leaf blowers, and equally powerful. They wanted to know about the timing, both the effective date of the bill, and also just the prolonged use of leaf blowers, which seems to be one of the big aggravating factors. How many hours of the day and days of the week. We have to listen to it, almost regardless of what type of blower. I hope that the bill will get at the major problems that we have heard. Will it get the key actors to change what they're doing? We don't want the companies and the individuals to try to get around the bill, to hide what they're doing, or figure they can get away from enforcement because there won't be any chance for DCRA to get out to the District in time to snag them. Will there actually be significant reductions in the most irritating noise? People want an improvement now, and I think the Council, like the ANC, is interested not just in taking actions so we can tell people we're doing something, but actually doing something that's going to make a substantive difference for people. Thank you very much for hearing our testimony. Mendelson: Thank you. Thank you, each of you, for your testimony. Miss Mladinov, I'm looking at your written statement, which seems to be, I want to say ambivalent about this legislation. Is that a fair characterization? It says, "I'm concerned that the legislation as written does not identify the problem carefully enough"? Mladinov: I would say it's a little bit more negative than ambivalent, because I have grave doubts myself about, especially, the enforcement. But I think also the targeting. It is an across-the-board ban on gas blowers. If you can get people to retire their blowers and get people not to use the blowers that they buy in the District within the District, I think it would be very hard to check on those things. I don't know who would be doing the enforcement. So, I really have doubts about the legislation, although I appreciate the purpose of it and really hope that we can achieve the purposes of the bill. Mendelson: But you raise other concerns. "Identify the problem carefully enough. Effectively target the most noisy and offensive leaf blowers." You had an A,B,C,D, but C was enforcement mechanisms, which you just spoke to, and the fourth is "Provide relief to residents." Okay, so I am reading this correctly, that you're critical of the legislation. Mladinov: I think it could be made much better, and that's why I voted against our resolution to support the bill. Mendelson: But how would it be made better? Mladinov: I'm a person who wants to work with other people. I think that there are ways of providing incentives through information, through consultation and coordination with landscaping companies, with vendors. I have a variety of suggestions on the third page to try to get people to want to get rid of noisy leaf blowers, instead of giving them an incentive to try to get around the legislation. Show them what the harms are, show them what the better options are. Maybe even get homeowner and tenant associations to give incentives to not hire contractors who are using noisy leaf blowers for prolonged periods. Discourage them for having so much leaf blowing going on, day after day. Some of our constituents suggested only once a week. It's so aggravating. So, we would love to see more coordination with more of the interested parties so they'll want to work together to solve this problem. Cheh: Yes, thank you, Mr. Chairman. And staying with that point, Commissioner, one of the reasons why we opted for this approach is exactly one of the issues that your raised, namely enforcement. It would be rather easy to determine whether a person or a company was using gas blowers as opposed to electric ones. And that's a huge improvement over the current noise enforcement. And then second, the gas blowers as a class are noisier, and their noise extends farther. So, I suppose, you know, in deciding how to do something, you can prescribe it. Or, alternatively, you could try to cajole people. But, in fact, even something that you just mentioned, maybe get everybody to agree to do it once a week. The enforcement and administrability of this alternative approach, I think would be even more difficult than what we have now. So, in thinking about this, so I don't want you think it was done thoughtlessly or too quickly, to look like we were doing something. The real answer is to move away from the gas blowers, and move to this other technology. It's better, it's quieter, it's healthier. And it really is the way to enforce the rules. So I just want you to know that it's not something that we came at kind of willy nilly. And the enforcement issue actually cuts against what we have now, or some of these alternatives that you're raising. I have no actual questions, Mr. Chairman. Thank you all for testifying. Lucian Pugliaresi. I'm sure I mispronounced that. Daniel Mustico, who's Vice President of Government & Market Affairs, Outdoor Power Equipment Institute, Inc., Chuck Elkins, who is Vice-Chair of ANC3D. Pugliaresi: Okay. Mr. Chairman, members of the Committee, thank you so much for this opportunity. First of all, I'm not going to go through my testimony as written. I'll submit it, but I want to affiliate myself with all of the previous testimony on the annoyance and the sort of health effects of the leaf blowers. One of the things that I think we should seriously think about is what we can do in the interim to lower the noise level, generally. Washington, DC is a beautiful city. And we have great neighborhoods, and unfortunately we can't get out in those neighborhoods and enjoy them because the noise is just relentless. One of the things that I'd like to do is have our ANC Commissioners to try to educate the community. You know, some of my neighbors, there are lawn companies blowing their leaves up and down the street for a half hour. Okay, we can live with those leaves. We don't need to have such pristine conditions that we have to have the blowers running 24/7 throughout the neighborhood. So, one of the things that I think I would hope the Council would take up, and maybe the ANC Commissioners, that look at incentives in the interim in which we can just cut down the frequency, perhaps accelerate voluntarily or through incentive structure, more use of battery-powered blowers. And sort of recognize this, that this is a kind of important quality-of-life issue for all of us living in the city. And with that, I'll conclude my remarks. Mendelson: Thank you. Mr. Mustico? I want to assure you, as you have already heard, that this is not just a Ward 3 problem. We have 12 advisory commissions’ [supporting resolutions from] across the city, and in seven wards, 46 neighborhoods. And, as you know, ANCs do not suffer fools easily. They don't put their names on resolutions unless they understand them and approve them. So this is not just a few residents in Ward 3 who are concerned about this. Mendelson: Thank you, Commissioner. Mr. Pugliaresi? We don't have a copy of your statement. Pugliaresi: Oh, okay, I'll submit it. Mendelson: Okay, and I couldn't tell from your oral remarks, are you in support of this legislation? Pugliaresi: I'm absolutely in support of this. Pugliaresi: And, you know, let me just say, I once served as a rather torturous role as president of the Wesley Heights Spring Valley Citizen Association. I'm well aware of how difficult all of these issues we face in our community -- zoning, and tree removal -- but this is an issue in which we need to do something now. I don't want to wait until 2022 to enjoy my neighborhood. And I understand we might not be able to have legislation. But I really do think we can reach out to the community, find ways to encourage people. We don't need to run those blowers three times a week in the spring and the summer. I mean, this is what happens in our neighborhoods. We really cannot enjoy this wonderful city. And I think we should try to get our ANC Commissioners to help with the communities to see what we can do voluntarily in the interim until we get this legislation passed. Mendelson: Thank you. So you'll provide a copy of your statement? Mendelson: Commissioner Elkins, you're testifying on behalf of ANC3D? Elkins: I am, but I'm also a member of Quiet Clean DC. Mendelson: Now, I see in the packet attached to your statement resolutions from different ANCs. Elkins: That's correct. They were gathered by an effort over the last year by this organization, particularly Grif Johnson. And I've submitted all of them. And you'll notice that they are from across seven different wards. Mendelson: Was adopted in 2015? Elkins: That's right. We were the ones who went first, and brought this attention forcefully to Councilmember Cheh's attention. She was already aware of it. We just reinforced it and urged her to write a bill. Mendelson: And your testimony is that your commission is still standing by that. Mendelson: Why leaf blowers and not all gasoline-powered lawn equipment? Elkins: Well, leaf blowers are the most noisy of all of this equipment. Secondly, the batteries can be moved to some of these other pieces of lawn equipment, so we think this is a good place to start. It's the worst case, and we think that, as my colleague here to my right says, we should let the marketplace work its way as well. So, we would start with leaf blowers, but certainly some of this other equipment I think will go in the same direction. And, in fact, is going. There are a number of battery-operated lawnmowers and other equipment at this time, as well. Elkin: I would just respond to that. The marketplace makes a lot of sense, except when there are externalities, and there are two major externalities here that are not controlled by the person who's buying the equipment, namely the lawn maintenance people. The hearing protection of their workers and the residents who are affected in the neighborhood. And so waiting for the marketplace to take care of the workers and take care of the neighbors is a false dependence on the marketplace. There is a role for regulation, and in this case it's a technology regulation that makes sense. Mendelson: Thank you Councilmember. Thank you, each of you, for your testimony. Mr. Mustico, if you want to supplement your statement given the questions, you remember that the record is open for a couple of weeks. Mustico: Mr. Chairman, I believe we've submitted a letter with some more extensive information already. But I'll confirm that, but I believe we have. But if not, we'll make sure to do that. Mendelson: Okay, yeah, please. Assume that we don't have it, because I don't remember seeing it, and Miss Powell to my left doesn't. Mustico: I'll check, and we will do that. Mendelson: Okay. The record's open for two weeks. It closes at 5 PM on July 16th.